The Betfred Super League structure guarantees one-up, one-down promotion and relegation in a 12-team competition. 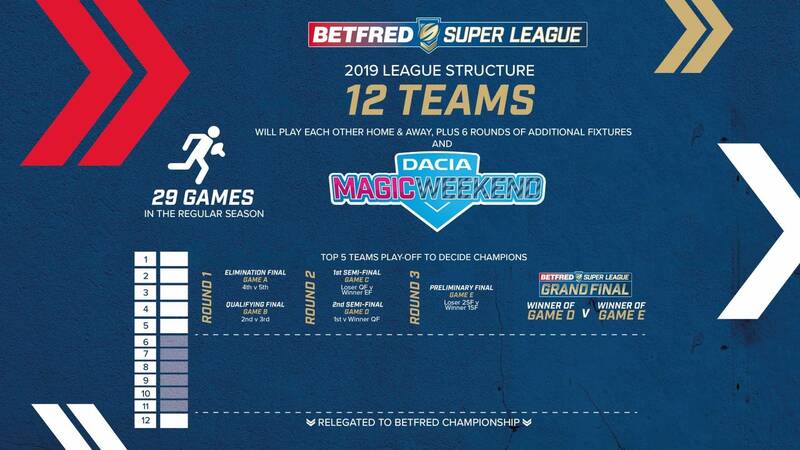 All teams will play each other once home and away, plus six additional fixtures and the Dacia Magic Weekend, ending with the top five teams in a play-off series which culminates in a Grand Final to crown the Super League champions at Old Trafford. 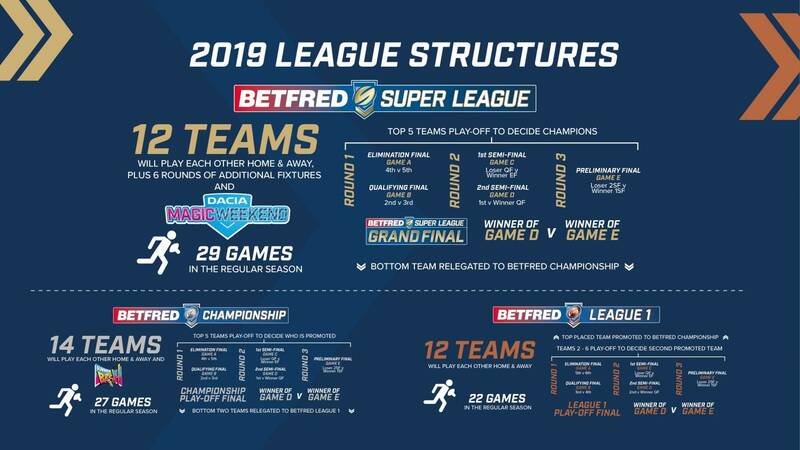 The Betfred Championship structure expands to a 14 team competition in 2019 with all teams playing each other once home and away, plus Summer Bash, ending with a play-off series for the top five teams with the winner promoted to Super League, and relegation for the bottom two clubs. Betfred League 1 will consist of 12 teams playing each other home and away with the top team automatically promoted. Teams 2-6 will play-off to decide the second team to be promoted. 1.1 How will the revised Betfred Super League structure work? 12 teams playing each other home and away, plus 6 rounds of additional fixtures, and Magic Weekend. Each club will have 14 home games and fans will have more certainty in knowing who their team will play each week. There are 29 games in the regular season. 1.2 How will the Betfred Super League Champions be decided? The top 5 teams after round 29 will go in to a play-off structure with the winner of the Betfred Super League Grand Final being crowned Champions. 1.3 How will relegation work in the Betfred Super League? The team that finishes bottom of the Betfred Super League at the end of Round 29 will be relegated to the Betfred Championship. There is guaranteed one-up, one-down promotion and relegation in a 12-team competition. 1.4 How will promotion to the Betfred Super League work? Details will be announced in due course following discussions by the Championship and League 1 clubs. 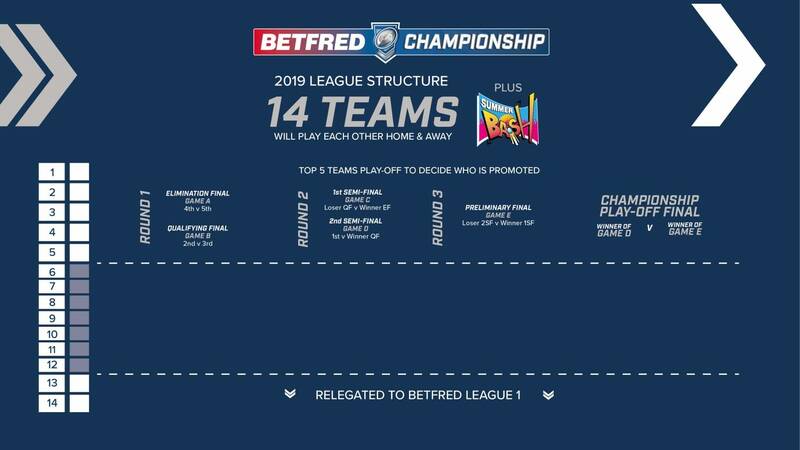 2.1 How will the Betfred Championship structure work in 2019? There will be 14 teams playing each other Home and Away plus Summer Bash. That’s 27 rounds in the regular season. 2.2 How will the promotion place to Betfred Super League be decided in 2019? There will be a top five play-off structure to determine who gains promotion to the Betfred Super League. 2.3 How will relegation to Betfred League 1 work in 2019? The bottom two teams at the end of the regular season will be relegated to Betfred League 1. 2.4 How will promotion and relegation between the Betfred Super League and the Betfred Championship work in 2018? In 2018, nothing changes, and The Qualifiers will determine which teams play in the Betfred Super League in 2019. The top three teams in The Qualifiers after the seven rounds will play in the Betfred Super League in 2019 with the winner of the £1M Game claiming the final spot. 2.5 How will promotion and relegation between the Betfred Championship and League 1 work at the end of 2018? - The team who finished top Betfred League 1 team at the end of round 26 will be automatically promoted. The 14th place will be decided by a match between the loser of the League 1 Promotion Final and the team finishing in 8th in the Championship Shield to be played on the weekend of 13th / 14th October 2018 (home venue determined by coin toss). 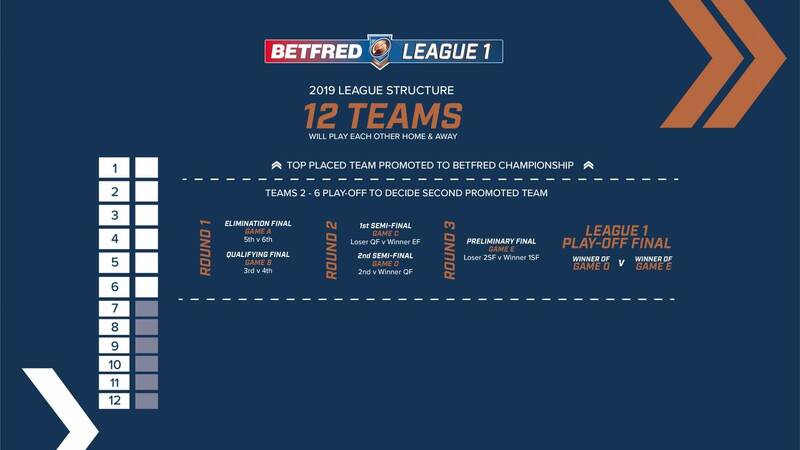 3.1 How will the Betfred League 1 structure work in 2019? There will be 12 teams who play each other Home and Away. 3.2 How will promotion and relegation work in Betfred League 1? The top team will be promoted to the Betfred Championship. Teams 2-6 will play-off to decide the second team to be promoted. As previously, there is no relegation in the Betfred League 1 structure.